“This is a happy day, an important day for the disability movement in Sudan”. Mr. Badraldeen, secretary general of the National Council of Persons with Disabilities of Sudan (NCPD), praised with these words the signature of four subgrants between the Italian Agency for Development Cooperation (AICS) and five Sudanese Organizations of Persons with Disabilities (OPDs) held in Khartoum on 20 March. The signature, celebrated within the framework of Bridging the Gap project, took place at the NCPD’s premises and includes the Sudanese Union for Deaf Persons, the Sudanese National Blind Association, the Physical Challenges Organization, and the Sudanese Autism Organization in consortium with the Sudanese Union for Intellectual and Psychosocial Disability of Khartoum State. The subgrants allocate 60,000 Euros to the four OPDs for the realization of activities aimed at improving the access to employment of persons with disabilities in equal conditions with others and in line with article 27 of the UN Convention on the Rights of Persons with Disabilities (CRPD), as well as to raise awareness on their conditions and situation in the country. “It is very important that all forms of disabilities are represented under these grants – said Mr. Daniele Manieri (AICS – BtG Coordinator for Sudan) – We want to foster joint actions and exploit commonalities among the funded actions”. 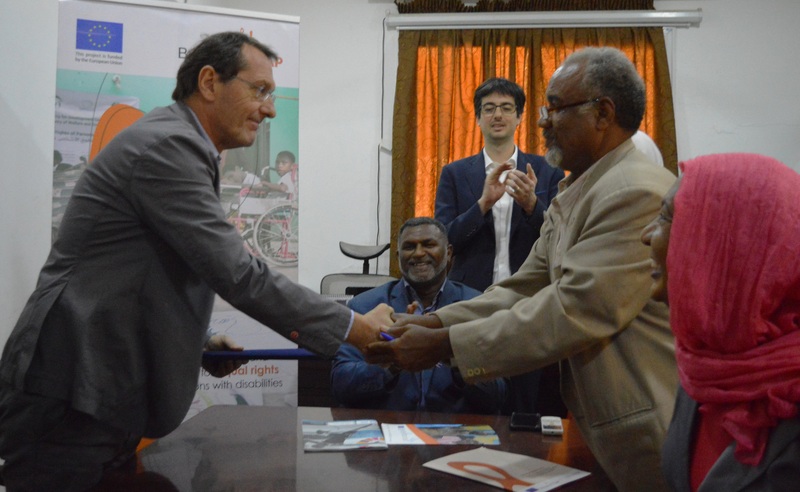 “Today can mark a milestone for persons with disabilities in the country – remarked Mr. Vincenzo Racalbuto (head of AICS Khartoum) and Mr. Federico Martire (Director of BtG for FIIAPP) – and we must see it as a beginning of a new phase”. Besides the subgrants, Bridging the Gap has been supporting the inclusion of persons with disabilities in Sudan through specific trainings for self-employability, seminars, and workshops for government officials on disability inclusion, and mainstreaming of the disability component into existing and new projects and initiatives of international cooperation.